Until recently, refugee resettlement was something the United States took on quietly and with a justified sense of pride. Even as immigration policy became a controversial issue, refugee resettlement was generally kept out of the fray. More recently, refugee resettlement has become a focus of uneasy attention. With the refugee ban that was implemented by the Trump administration in the beginning of his term and the decision to cut resettlement numbers in half, it is more important than ever to recognize the significant contributions that refugees make to the United States economy. To understand where refugees are playing a role in the local economy, the Fiscal Policy Institute compiled data about where refugee resettlement has taken place over the past 10 years. Data about refugee arrivals and placements has long been readily available at the state level. Researchers looking to compare refugee resettlement across localities, however, have faced challenges in finding the numbers. Below is a compilation that allows for comparisons across local areas. This is, as far as we know, the first time the local data has been compiled across all states, and the first time it has been aggregated by metro area. * all metro areas ranked by number of refugees placed. * number of refugees placed in localities within the metro areas. Metro areas, which include both central cities and their suburbs, are the geographical unit that allows for the most reasonable apples-to-apples comparison across the country. For this analysis the Fiscal Policy Institute uses the Metropolitan Statistical Areas as used by the Census Bureau. It is nonetheless interesting to note the local areas in which refugees are placed. 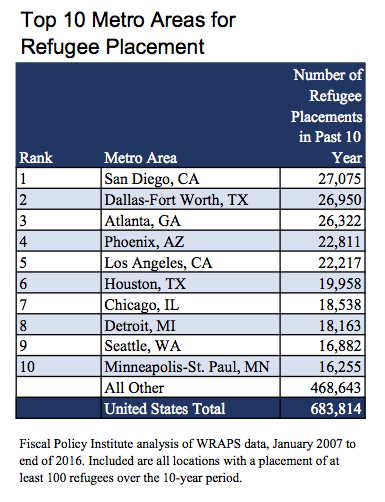 In looking at localities within the metro areas, note that the place recorded in the data refers to the location of the refugee resettlement agency. The refugees are likely settled within the metro area of the locality, but not necessarily within the locality itself.